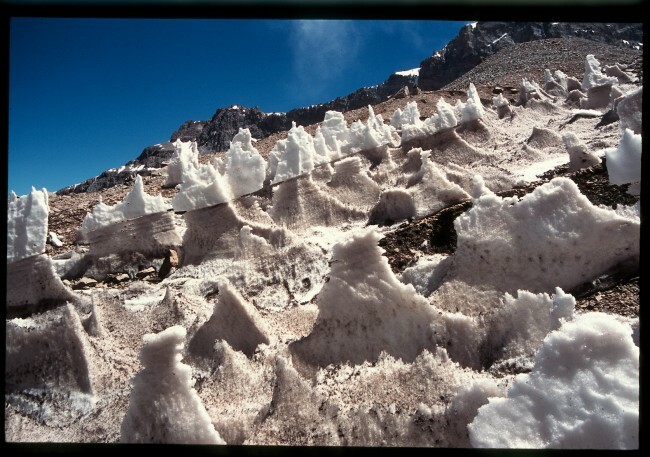 Description: Small penitentes near camp I.
the penitentes are formed when the strong winds carve out the snow and ice that melts because of the strong solar power. these were the neatest formations to trek through after base camp on our way to camp 1. Canadian Summit team from Prince Rupert BC Canada (5pp) Summit January 25, 2003! congratulations on your Aconcagua summit! If you have nice pics yourself, you can register and upload them and send them as ecards!